Support Services, Resources, Chambers, Health and Human Services, Ulster County, Hudson Valley, New York State, NYS - TheCommunityGuide.net published by First Connections, Inc. This site has good results for connecting owners with their lost animals. If animal or person is in immediate danger, call 911. Wildlife Rehabilitators provide information & help in caring for orphaned and injured wild animals, bringing them back to health, and then returning them back to the wild. Rehabilitators will accept all animals unless specified. • Information and referrals to local wildlife rehabilitators. • Accepts raptors, wading birds, water fowl, game birds. Educational programs. • Provides education and referrals to local wildlife rehabilitators. • The Business Alliance of Kingston (B.A.K.) is a coalition of business leaders from Kingston's three business districts, Uptown, Midtown, and the Rondout. 257 Main Street, New Paltz, NY 12561. Please consider patronizing our wonderful Business Supporters. • A virtual community where cancer patients and their families can find hope and inspiration. Services include prerecorded discussions, personal stories, discussion boards, chat rooms, secure email, and personal web pages. • Respite recreation programs designed to benefit the families of children with disabilities. Cancer Support House, 80 Mary’s Ave., Kingston. • Support services include in-home social worker, short term counseling, conflict resolution, caregiver support, and grandparents raising grandchildren support groups. Support meetings are held in New Paltz, Saugerties, Kingston, Ellenville, Shandaken and are lead by Licensed Social Workers offering understanding, a safe place to vent and helpful advice about services that can help you to provide the best care for your loved one. The groups are free and open to the public due to funding by the Ulster County Office for the Aging and JFS. • Support groups for caregivers who look after persons 60 and older. • Provides parenting education, support groups, outreach and activities to people who are raising the child of a relative. Program available for children (RAPP Kidz Club) that meets simultaneously. • Equipment Loan Closet provides equipment on loan to individuals who cannot afford to buy their own, or if insurance does not cover the cost. • Respite Program. Provides services for children with special needs including therapy, social work, and respite. • Offers referrals to families looking for legal child care providers in Ulster County. • The CMC is an association of outdoors-people who love to hike, camp, fish, hunt, canoe, kayak, bike, climb and otherwise enjoy nature and non-motorized outdoor recreational pursuits in the Catskill Mountains. • Gardening and landscaping information, soil tests, insect & plant identification. • Addresses the needs of children and their families in Ulster County through many diverse services. • Small social organization focused on teaching and learning about all things fungal. Come join us for a walk. • Providing and encouraging public awareness to buy locally, to sustain the local economy and the value of supporting locally owned independent businesses. • Dial 2-1-1 on your telephone for free and confidential access to health and human services Information and Referral (I&R), as supported by United Way. Available 24-hours/7 days a week. • Medical, housing, and legal aid to financially distressed individuals in the creative arts. One time grants. View Township websites or connect with individual Township offices. 23 single-member legislative districts every 2 years. To find your representative go to the top of the website page, click on "LOOK UP", enter your zip code, and click to "Find Your Rep". US Congressional Representative John J. Faso, 19th Dist. Social Services, Ulster County Dept. • Assists Ulster County’s existing businesses to grow and thrive, as well as helps new businesses locate into the County and become successful. Offers information on all available funding and incentives, site locations, and general business counseling. 845-339-4990. Click Here For Discount Offer. • Montano's shoe store was established in 1906 and is currently owned and operated by 3rd and 4th generation members of the family, Anthony and Edward Montano. They carry an enormous selection of footwear for men, women and children, with over 100 brands including Red Wing, Merrell, Uggs,and Dansko. They also offer a full line of over the counter and custom made orthotics, as well as orthopedic shoe modifications. • A collection of Ulster County resources designed to help individuals craft their plans for wellness and recovery. Topics include crisis services, shelters, hotlines, services for addiction, bereavement, children & family services, health & medical services, mental health services, senior services, and much more. • Limb Loss of the Hudson Valley provides facilitators to assist in maintaining positive attitude, identifying and using resources, learning ways to deal with emotions and feelings, developing effective coping skills and adaptive behavior, enhancing self-esteem, and helping yourself and others. • Traumatic Brain Injury; to facilitate in identifying and using resources, developing coping skills and adaptive behavior. • Annual National Cancer Survivors Day event. Cancer, Support & Information Services/ Breast Cancer Options, Inc.
• Committed to providing individuals with the skills and knowledge to manage diabetes and prevent diabetic complications. The Diabetes Education Center is also a community resource center that hosts trainings and educational programs and offers information about diabetes. 845-334-4249. 37 Albany Ave., Kingston. • Assist individuals and small businesses enroll in the NYS of Health Marketplace under the ACA. • Serving adults diagnosed with HIV/AIDS. HIV counseling and testing, primary medical care, gynecological services, case management, peer support groups, nutritional counseling, limited transportation service for medical appointments. • Services offered for clients with HIV/AIDS: Case Management, Support Groups, HIV Testing, Prevention, Outreach, Correctional Program, Food and Nutrition. • Helping terminally ill patients and caregivers with nursing care, home health aides, medical equipment, prescriptions, private and group counseling for children through adults. Support available 24/7. Servicing patients in their homes; all area hospitals; and many nursing homes. • Information and enrollment into NYS Health Insurance Programs. • Serving people with HIV & AIDS, developmental disabilities, mental illness, and alcohol and substance abuse. Parent Support - Empowering Parents Through Support. • A Monthly support group for parents and caregivers who are looking for help in coping with a child who is having social, emotional, or behavioral difficulties. Children’s Services, MHA, 845-339-9090, ext 2304. • Provides moral support and fellowship to people with Parkinson’s Disease, their families and caregivers. • Exercise classes for Parkinson's and other neurological conditions. • Low-cost reproductive health services for women and men. • Offers a wide variety of educational workshops on sexuality, LGBT issues, and relationships. • Advocacy for Disabilities Issues, Long Term Care Insurance, Information/Counseling, Case/Care Management, Disability Rights Group; to provide support, assistance and advocacy for individuals and families needing help with issues relating to disabilities. • Facilitates the creation and implementation of health and wellness action plans for the management and prevention of chronic diseases such as high blood pressure, diabetes, arthritis, and more. • Any problem under the sun. 24-hour anonymous, confidential hotlines. Case management, advocacy, adult, children and family services, housing, domestic violence, child care, emergency assistance. • The Ulster County Department of Health and Mental Health offers a wide range of services and programs to County residents designed to prevent illness and ensure their physical, psychological and emotional well–being by working with a broad spectrum of community partners to provide preventative health and mental health programs and services that directly benefit the people of Ulster County. • Ulster County Habitat for Humanity is a nonprofit housing organization working locally to bring people together to build homes, communities and hope. There is nothing more fundamental and impactful for an individual or a family than having a safe and stable place to live. Habitat’s vision is of a world where everyone has a decent place to live and we work toward this vision by building homes in partnership with individuals and families in need of secure and affordable housing. With our help, local Habitat homeowners achieve the strength, stability and self-reliance they need to build a better, healthier and more financially sound life right here in Ulster County. • Affordable housing for seniors, low-income families, and people with disabilities. • OMH Supported Housing Program, 845-9110 x 226. Weatherization Program/ Ulster County Community Action Committee, Inc.
• Residential energy efficiency program that reduces energy use. Homeowners and renters may be eligible to receive free services on their home to make it safer, more comfortable and energy efficient. IT'S THE LAW! Recycling is required in Ulster County. • Most townships in Ulster County require that you make your own arrangements for disposal of your refuse & recycling. Contact your local town office to determine your responsibilities. • You can arrange to have refuse/recycling picked up by a local private hauler, or you can get a Permit to take refuse to your Town's Transfer Station. Check website for hours and load in times. • The Ulster County Resource Recovery Agency periodically provides collections of paints, pesticides, chemicals, toxins & other household hazardous waste. • Electronics Recycling is available for free at the Ulster County Resource Recovery Agency. Must sign in at office; Monday through Friday 8am-3pm (except holidays). Post your items online! Give it away for free or at a fee, get something you like, help save the landfills! Donate Your Items To Charities, Homeless Shelters, Thrift Shops. Here are a few non-profits that could use your donated items! Seek out agencies in your community that could use your donations! Supporting Our Homeless Shelters. Donations may be brought to the Thomas Street location in Kingston or to the Walk-In Center nearest you. Call 845-338-2370 to arrange pickup or drop-off of your donation. • The Hudson Valley Long-Term Care Ombudsman Program helps to identify and resolve the concerns of residents living in local Nursing and Adult Homes. • Caregiver groups and support. • Home Visitors Program - Mental Health workers make home visits to assist seniors though assessment and supportive counseling. • A community on the topic of senior care providing information on home health care, assisted living facilities, and independent living facilities. • Teaches computer skills to people over 50. • Every third Wednesday of the month, enjoy a heart-healthy breakfast, socialize and engage with HealthAlliance medical experts. • Seniors may ride half fare on the Ulster County Transit Fixed Route System (UCAT) during the hours of 9am and 3pm. Personal care attendants ride free. All UCAT vehicles are wheelchair equipped. 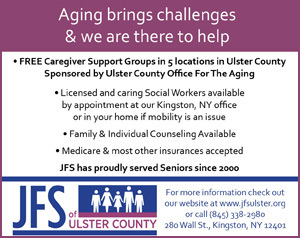 • If you are 60 or older, and are registered with the Office for Aging (OFA) (https://ulstercountyny.gov/ucat/ofa-registration), you may ride one round trip for shopping and two round trips for medical service per week free on the Ulster County Area Transit System (UCAT) or the Ulster County Office for the Aging Medical Van. The medical van is available to all seniors who live and require medical transportation within Ulster County. The van is wheelchair accessible. Service is based on availability and advance reservations are required. Seniors must register for participation. Call 845-334-8120 for further information and to make a reservation. • Seniors can call for next day Curb-to-Curb service through OFA at 845-334-8120, Mon-Fri, 8am-4pm. This is a First-Come\First Serve arrangement as the department only has one van. You should call as soon as you know the day you need this service, no matter how far in advance. NOTE: Please call to cancel or reschedule if your pick-up is not needed on the day reserved. ADA (American Disability Act) Paratransit Service is available with at least 24-hour notice, under most circumstances. If you live within the county service area and are unable to use fixed-route service due to a disability you may qualify for ADA service. To determine eligibility, contact Mike Olivieri at 845-334-8135; riders must complete a certification application. Once qualified, you can call the reservation line at 845-334-8120 to schedule your reservation. Reservations for ADA Paratransit is a guaranteed pick up. NOTE: Please call to cancel or reschedule if your pick-up is not needed on the day reserved. • Bus service throughout Ulster County with limited service to Orange County. • Discount Bus Passes available. • Free Ulster County Bus Pass for eligible families. • All buses are equipped with bicycle racks. • Medical Van provides transportation for seniors 60 years and older. See Transportation under Senior Services above. 845-340-3333 for further info. Dispatch number, 845-334-8458. • Provides support to County veterans and their families in obtaining benefits (medical, disability, pension, tax exemptions, employment, home loans, education, transportation, etc.) from the U.S. Veterans Administration (VA) and the NYS Department of Veteran Affairs. VOTE - REGISTER in Ulster County! Download Voter Registration Forms from your Board of Elections online. Pick up Voter Registration Forms year round at any Post Office, Library, State Agency, Town Halls, or Motor Vehicle Bureau or call the Board of Elections, and they will mail you the forms, as well as Absentee Ballots. • Call or Fill in a questionnaire online to get a personalized list of programs and agencies that handle specific disaster recovery such as Business and Industrial Loans, Disaster Resources for Older Americans, Rural Housing: Housing Repair Loans and Grants, etc. • To be used during storms and other emergencies. Ulster County residents can call 1-888-455-1616 during emergencies for important recorded information and updates, such as road closures and shelter locations. • The Disaster Distress Helpline is a 24/7, 365-day-a--year, national hotline dedicated to providing immediate crisis counseling for people who are experiencing emotional distress related to any natural or human-caused disaster. The National Weather Service is the official source for weather information and severe weather watches and warnings. Follow latest forecasts at www.weather.gov or http://mobile.weather.gov on your phone. EMERGENCY PREPAREDNESS PLAN - ARE YOU READY? What would I do? That’s an important question to ask, especially when you’re thinking about safety in the event of an emergency. Having a preparedness plan before an emergency happens is essential to your safety. Make sure you’re ready by taking our Red Cross Preparedness Quiz at http://www.redcross.org/lp/preparedness-quiz. It’s just five questions, and you may learn something new that could help you and your loved ones stay safe in the event of a disaster. Knowledge is the first step in readying yourself and your family in case of emergency. From having a packed emergency kit to picking your family meeting place, preparedness is essential. Unplug small appliances and computers. www.Ready.gov (or in Spanish at www.Listo.gov). The FEMA mobile site (http://m.fema.gov), mobile app (https://www.fema.gov/mobile-app) and text messages (http://www.fema.gov/text-messages) also provide regular updates. Sharing information using social media tools is also a good way for residents to stay informed. Recent updates to our apps were made earlier this month and users need to download these updates at CentralHudson.com/mobileapp for complete access. Pay close attention to weather advisories and storm warnings. Refuel vehicles and ensure they are in good working condition. Have a phone that does not require an electric outlet to operate. Charge cell phones or have a car cell phone charger. Stock water and packaged or canned foods that do not require refrigeration or cooking. Be sure to have a non-electric can opener. Have a battery powered radio to keep informed of restoration efforts. Ensure adequate supplies of medications, cash & other necessities. Have a plan to check on vulnerable neighbors and family members. You can access a mobile version of Central Hudson’s website with your web-enabled cell phone or mobile device at mobile.CentralHudson.com. » Stay at least 30 feet away from downed power lines, and lines that may be entangled and hidden in fallen trees. Assume a downed line is live. » Avoid using candles for illumination. » Never use outdoor gas or charcoal grills indoors, as they pose a _re hazard and, over time, can give o_ deadly carbon monoxide gas. Use these appliances outdoors only, with proper ventilation. Operate motor vehicles outdoors only, and never in the garage. If you see a downed power line, move away from it and anything touching it. The ground around power lines may be energized. Call Central Hudson immediately and we'll take care of the problem. Back-up generators require proper, professional installation. Never plug a generator into any electric outlet in your home. A wrong connection could feed electricity back through the lines and endanger the lives of our repair crews. Check local ordinances to see if you need a special permit and inspection. • Read all manufacturer’s instructions. • Follow instructions on properly “grounding” the generator. • Don’t exceed the manufacturer’s rating for total electric load. should never be operated in an enclosed building. Locate it outdoors in a dry area. • Turn the generator off to refuel, and store fuel in a properly designed container. • Use only UL-listed, three-prong extension cords. • Keep cords out of the way, and don’t run them under rugs or carpets. To speak with a Central Hudson representative, customers can call (845) 452-2700 or toll-free at 1-800-527-2714. Please note that due to heavy call volume, there may be significant hold times. If you would like to report an outage or check on restoration status, please click here instead and perform your report/request online so customers reporting hazardous situations can have their calls answered more quickly. -- Fill ziploc bags with water, and freeze them for extra ice! -- In your garage or even outside the house, fill a couple of large plastic tote boxes up with water from your garden hose (or from the storm's rainwater), as an extra supply of water to flush toilets. -- If you use online banking to pay your bills, set up your bill payments online before the storm, as you might not have power for a while. Your everyday commute may be interrupted by unexpected events preventing you from making it on time to your destination. Remember the time to plan is now, not later! Visit http://www.ready.gov/ for a list of ways to be prepared for natural disasters. - Make a plan and know what to do during an emergency. - Make alternate methods of communication in case traditional means are not available. When There Is No Hurricane: Make a Hurricane Plan! - Build or restock your basic disaster supplies kit (http://www.ready.gov/kit), including food and water, a flashlight, batteries, chargers, cash, and first aid supplies. - Consider buying flood insurance (https://www.floodsmart.gov/). Familiarize yourself with local emergency plans. Know where to go and how to get there should you need to get to higher ground or to evacuate. - Stay tuned to local wireless emergency alerts (http://www.ready.gov/alerts), TV, or radio for weather updates, emergency instructions, or evacuation orders. - Make a family emergency communication plan (http://www.ready.gov/make-a-plan). Preparing Your Home - Trim or remove damaged trees and limbs for safety. Secure and reinforce outside items (roof, windows, doors). - Review your evacuation route(s) & listen to local officials. ·Review the items in your disaster supply kit; and add items to meet household needs for children, parents, individuals with disabilities or other access and functional needs (http://www.ready.gov/individuals-access-functional-needs) or pets. - Follow evacuation orders from local officials, if given. ·Check-in with family and friends by texting or using social media. - Watch out for debris and downed power lines. ·Avoid walking or driving through floodwaters, which may be electrically charged. - Just 6 inches of moving water can knock you down, and fast-moving water can sweep your vehicle away. Wildfires often begin unnoticed. These fires are usually triggered by lightning or accidents. They spread quickly, igniting brush, trees, and homes. Reduce your risk by preparing now, before wildfire strikes. Meet with your family to decide what to do and where to go if wildfires threaten your area. - You should build an emergency kit and make a family communications plan. - Regularly clean roof and gutters. - Install a dual-sensor smoke alarm on each level of your home, especially near bedrooms; test monthly and change the batteries at least once each year. - Teach each family member how to use a fire extinguisher (ABC type) and show them where it's kept. - Contact your local fire department, or forestry office for information on fire laws. - Make sure that fire vehicles can get to your home. Clearly mark all driveway entrances and display your name and address. - Teach children about fire safety. Keep matches out of their reach. - Post fire emergency telephone numbers. - Plan several escape routes away from your home - by car and by foot. - Talk to your neighbors about wildfire safety. Plan how the neighborhood could work together after a wildfire. Consider how you could help neighbors such as elderly, children or disabled persons. - Have a fire extinguisher or garden hose on hand when burning debris. - Wildfires: Are You Prepared. L-203. Wildfire safety tips, preparedness and mitigation techniques. - Charge cell phones and any battery powered devices. - Purchase ice or freeze water-filled plastic containers to help keep food cold during a temporary power outage. - Keep your car’s gas tank full-gas stations rely on electricity to power their pumps. Do NOT keep the car running in a garage, partially enclosed space, or close to a home, this can lead to carbon monoxide poisoning. - Learn about the emergency plans that have been established in your area by visiting your county website. - Keep refrigerator and freezer doors closed. - Put on layers of warm clothing if it is cold outside. - Turn off or disconnect appliances and other equipment in case of a momentary power “surge” that can damage computers and other devices. - Only use generators away from your home and NEVER run a generator inside a home or garage, or connect it to your home's electrical system.